The Sahara's more than 3 million square miles of desert covers almost the entire northern region of Africa. It spreads throughout countries such as Egypt, Morocco and Algeria. It has large shifting sand dunes and barren rocky plateaus. However, in northern and southern areas the Sahara also has grasslands, desert shrubs and trees. These areas make thriving homes for a variety of wildlife, including rodents. Various species of rats, mice and gerbils are found throughout the Sahara. For example, fat sand rats (Psammomys obseus) are native to the region. Their water needs are fulfilled by eating leaves of saltbush plants. The Sahara is home to one of the smallest gerbil species, the lesser Egyptian gerbil (Gerbillus gerbillus). These gerbils average around 3 inches in length. Cairo spiny mice (Acomys cahirinus) are one of the more interesting looking mouse inhabitants. Their grayish brown coats have bristles resembling that of a hedgehog. Among relatives of rats and mice are jerboas. They’re often called kangaroo rats or kangaroo mice because they have the appearance of tiny kangaroos. Their long hind legs are used for hopping, and their small forelimbs have well-developed claws for shifting through sand. Greater Egyptian jerboas (Jaculus orientalis) have one of the longest leg lengths of the species, making them approximately 5 inches tall. Jerboas survive the hot desert temperatures by staying buried in their burrows during the day. 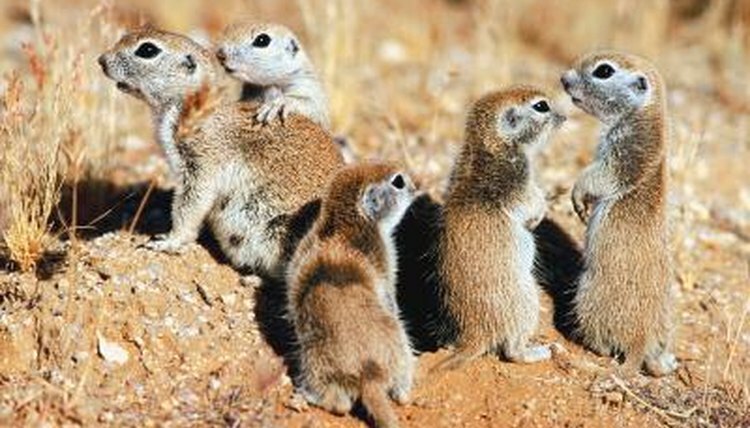 Ground squirrels (Xerini) live in arid open areas where the soil is firm enough to dig complex colony burrows. Different members of this species are usually similar in appearance. Most are brownish in color with black or white stripes on their backs or flanks. Although they’re diurnal, they avoid the midday heat by being most active in the mornings or late evenings. Most hares such as African savanna hares (Lepus microtis) are solely nocturnal. In large numbers these squirrels and hares can be pests to crops. Not only are porcupines are the largest rodents in the Sahara, but North African crested porcupines (Hystrix cristata) are among the largest in the world. They can weigh up to 60 pounds and measure up to 4 feet in length including tail. Their quills are typically more than a foot long. When threatened they will shake their quills to produce a rattling sound then charge their enemy back-end first. Their thicker quills can inflict deep wounds that are fatal. They have been known to injure lions, hyenas and humans.